Carpet- Top Manufacturers, Low Mill Direct Pricing, Highest Quality Installation! HARDWOOD FLOORS - Unbelievable Options! Highest Quality Installation with Great Prices! CERAMIC TILE - More Options with Quality Installation at Great Prices! Welcome to Twin Flooring! For over 25 years we’ve provided and installed quality flooring products to Pittsburgh area residents. We take great pride in our personal service and quality workmanship from sales to installation. We take customer satisfaction very seriously. Since most of our business are repeat customers or referrals, we must be doing a good job! For all of your flooring needs rest assured we’ve got you covered! Flooring Store Pittsburgh, PA -Mill Direct Pricing! Here at Twin Flooring our store is a fully stocked showroom waiting for you. Our goal is to provide you with the best selection, service, price and ease. As a Mill direct company, we deal directly with the Mills representatives. This means fewer hassles and considerable savings to you. We are committed to providing you with over 4000 choices of name brand carpet, ceramic tile, hardwood, and the latest styles of laminate and vinyl flooring. Shop at Home with Twin Flooring Pittsburgh! You tell us what carpeting or flooring you’re interested in and we will bring a variety of samples to your home. Many of our customers love to compare the samples to their home’s decor to be able to make the best choice without delay. For many of our satisfied customers, some decisions are better made at home. 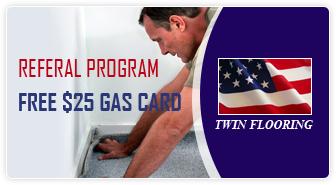 Unlike other companies, all of our flooring installers are Twin Flooring employees. They are highly trained and perform a 10 point checklist on every installation. No sub contractors here! Our goal is to have your carpet installed within 7 to 10 days of your order. If we have it in stock (which in most cases we do we stock thousands of yards of quality name brand carpet at the warehouse), we usually can install within 3 to 4 days. Just wanted to say thanks again! The shop at home feature was so convenient! 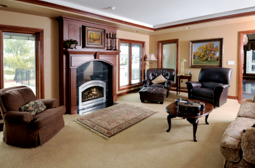 I was able to see exactly what carpet looked the best in my living and dining rooms. I’d recommend you guys anytime, I love my new carpet! !